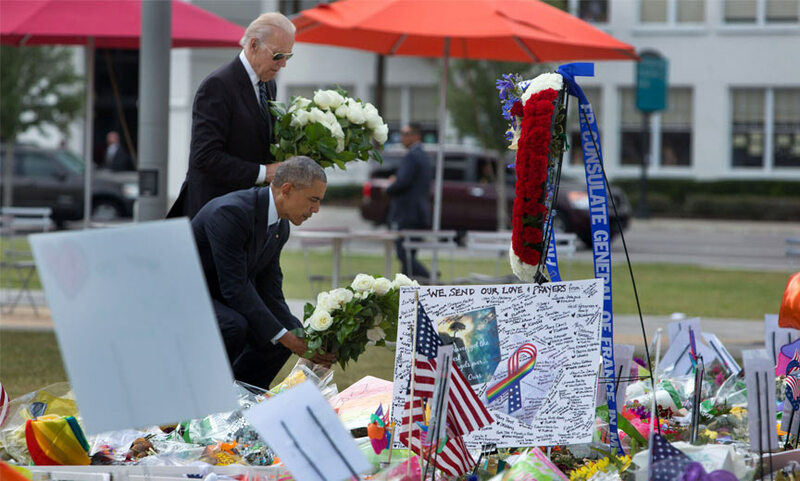 President Obama and Vice President Biden mourn the victims of the Pulse massacre in 2016. What a difference a year makes. A new study finds that 2017 was the deadliest year for LGBTQ people in the United States since record keeping began. The newest National Coalition of Anti-Violence Programs (NCAVP) survey reports some 52 anti-LGBTQ homicides occurred in 2017 — an 86% increase from the previous year. In August, the organization released their mid-year report, which provided early indicators that 2017 was already deadlier than all of 2016. Drilling down, the other NCAVP findings are equally disturbing. For example, the report states that in 2017, there was “the equivalent of one homicide of an LGBTQ person in the U.S. each week. There was a significant increase of reports of homicides of queer, bi, or gay cisgender men, from 4 reports in 2016 up to 20 reports in 2017. Over the last five years, NCAVP has documented a consistent and steadily rising number of reports of homicides of transgender women of color, which continued into 2017. Last year, the NCAVP documented 27 hate/violence related homicides of transgender and gender non-conforming people, compared to 19 reports in 2016. 22 of these homicides were of transgender women of color. Of the total number of homicides in 2017, 71% (37) of the victims were people of color: 31 (60%) of the victims were Black, 4 (8%) were Latin, 2 (4%) were Asian, and 1 (2%) was Native American. Additionally, 12 (23%) of the victims were white and 2 victims’ racial and ethnic identity is unknown. 67% (35) of the victims were age 35 and under. Guns were used in 59% (28) of the total number of homicides thus far in 2017, including three people who were shot and killed by police. Over half of the homicides occurred in just five states. New York and Texas had the most anti -LGBTQ homicides, with 7 victims in Texas and 6 victims in New York. Georgia had 5 victims of anti-LGBTQ homicides, and Louisiana and Florida both had 4 victims of anti -LGBTQ homicides. The report concludes that “the violence is not new, but amplified.” In part, it’s possible that increased reporting of violence against the LGBT population has led to a statistical jump. Others of course, hold the Trump/Pence regime responsible as emboldening hate groups across the board. In reality, the numbers could be skewed in several directions: some theorize that there were more incidents of hate crime than have been reported, while others suggest the increase could be explained by more incidents being reported. Read more about the violence LGBTQ Americans face today.